Social Art Projects With No Experience Needed! We believe that each person has artistic ability which can be brought out in a fun, relaxing atmosphere which we seek to create at each and every Social Art event. Offering paint nights/days, jewelry making workshops, and other fun projects, there is something for everyone! We offer public events in our beautiful Kitchener studio as well as in select local venues or right in the comfort of your home. and Platinum Winner for KW’s Favourite Recreational Facility! More than just an art studio. More than just an art studio - Social Art offers a new environment to host your next event. Looking for a new birthday party location? Social Art will host your birthday party, where one can express their inner creativity. 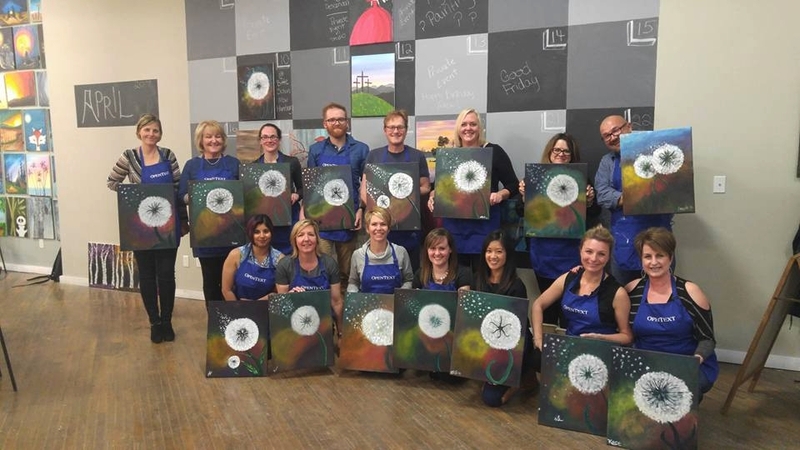 Host your next team building event at Social Art. We have creative ideas to make your next team building session a success. Social Art is available to rent for private events. Whether you are hosting a party or meeting, our space offers a variety of options for your next private event. Supporting your cause through a fun and relaxed Social Art project. We take the hassle out of planning your next fundraiser or community event. Join in on one of our public Diffuser Bracelet Workshops, or host your own private girl’s night right in our gorgeous studio, or in the comfort of your own home. Choose from our selection of stones, and create your own one-of-a-kind piece of jewelry.